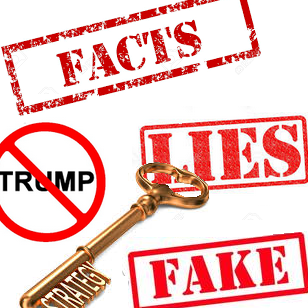 Here are 11 strategies to challenge Trump and his lies. Resistance to the ruling Republican administration is both appropriate and necessary. All who care about the environment, climate change or social justice are called to peacefully and lawfully oppose this government. Trump is increasingly vulnerable in the wake of his unprecedented unpopularity, the ongoing investigation into his team's collusion with Russia, and his inability to repeal and replace the Affordable Care Act. Trump has publicly lied more than 4 times every day since becoming president (according to a recent Washington Post article he has lied 317 times since becoming president). Trump may be the chief liar but he is not the only liar in this administration. His adviser Kellyanne Conway is now infamous for spewing a litany of untruths in her efforts to legitimize "alternative facts". Press Secretary Sean Spicer has lied so many times he can give his boss a run for his money. We cannot allow the cavalcade of deception to become normal. This is not about hating Trump it is about loving America's great democracy. This administration depends on fake news to control the narrative and deceive Americans. Disparaging the press is key to their success as they are vulnerable to fact based news. Trump has given an indication of just how far he will go when he shut down press access earlier this month. Exposing lies is a core part of the mission of fact based news. Facts are the bedrock of democracy (a point echoed by President Obama in his farewell speech) and essential to upholding the Constitution. It is critical that we refute the false narratives of this president who has become the chief advocate of a post factual world. It is the future of the United States and by extension the future of the free world that hangs in the balance. There are already efforts underway to combat fake news. Social media platforms including Facebook and Google are working to confront fake news. In November Facebook CEO Mark Zuckerberg said his company is responding to lies which he referred to as "misinformation". As reported by NPR, some of the ideas being proposed include automatic detection of potentially false stories and easier flagging by users. Another NPR article outlined some of Zuckerberg's approaches to combating fake news that range from consulting with journalists and fact-checking organizations to disrupting the flow of money to fake news organizations. "[W]e know people want accurate information," Zuckerberg was quoted as saying. He outlined a variety of steps including better detection, easier reporting, warning labels, assessing the quality of related articles, disrupting fake news economics, and listening to journalists and others. Wikipedia is the best-known, oldest and most trusted example of an open community. They are self-regulating and yet they seem to get it right most of the time. According to a psmag article, Wikipedia is cultivating an army of fact checkers to battle fake news. Given their decade and a half track record of defending themselves against fake news, they have an approach that may be worth disseminating. Wikipedia has been combating misinformation with strict vetting guidelines that Wikipedians (active editors in the Wikipedia community) transparently refine and enforce. They have developed very extensive policies for determining what is a reliable source and what is not. Although Wikipedia is far from perfect, they do offer a working example of an information source that has not been contaminated with polarized viewpoints. With the help of the Wiki Education Foundation, Wikipedia wants to "engender its unique institutional brand of media literacy in every young mind in the country." The idea is to provide a crash course in the site’s rigorous research and fact-checking process. "Generally, we believe that if you give people good information, they can make good decisions, and that comes with trusting the users," says Wikimedia Foundation communications director Juliet Barbara. "Having open, transparent spaces for public discourse is really critical: Behind every Wikipedia article, there’s a newsroom in the form of a Talk channel, where editors are discussing current events and bringing different points of view to the table." Of course people can do their own research and cross reference sources. We can also avoid outlets known to be purveyors of fake news. Simply put, the best way to expose fake news is to step outside your ideological bubble and expose yourself to news that is generated beyond your silo. Here are a few approaches (many of which can be found at Political Murder) that challenge the Trump administration and their lies. Don't be conned by Trump’s game of "divide and conquer"
Common threat from an administration that is hostile to the very notion of freedom of the press. "[Reporters] can’t back up or back down or turn around. We can’t get distracted or lose focus or, for that matter, deal in any kind of cowardice, small or large." Acknowledge the media's special responsibility as part of the checks and balances in our system. We can all step up and say simply and without equivocation, "a lie, is a lie, is a lie!" Do whatever is in our power to diminish the liar’s malignant reach into our society. Every Republican must be asked: "What will you do to combat the lying from the White House?" "We will set higher standards for ourselves than ever before. We credit you [Trump] with highlighting serious and widespread distrust in the media across the political spectrum. We have to regain that trust. And we’ll do it through accurate, fearless reporting, by acknowledging our errors and abiding by the most stringent ethical standards we set for ourselves. We’re going to work together. We now recognize that the challenge of covering you requires that we cooperate and help one another whenever possible (you’re going to face a unified front). We’re playing the long game. You have forced us to rethink the most fundamental questions about who we are and what we are here for. Best-case scenario, you’re going to be in this job for eight years. We’ve been around since the founding of the republic, and our role in this great democracy has been ratified and reinforced again and again and again." 4. When Trump/Bannon overreaches, all must call them out. When they lie, all must expose them. When they are treasonous, say so. Loudly. 5. When a Trump family member is in a meeting they should not be in, question it immediately. 9. Media should boycott the White House Correspondents Dinner unless Trump agrees to free & open press. For a summary of 99 ways to combat Trump click here.